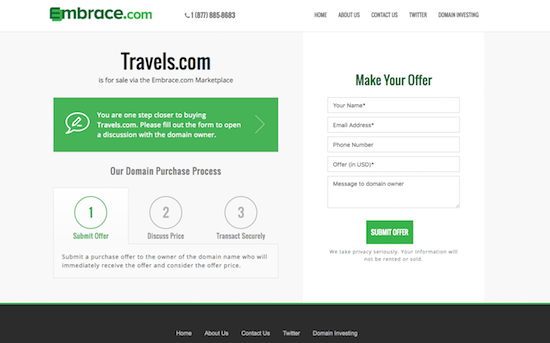 Domain for sale landing page design is a popular topic. Most parking service providers offer their own purchase/inquiry/offer landing pages, some with customizations and others without them. There are templates to use and companies like Efty that offer landing pages for users to sell their domain names. I’ve always thought less is better when it comes to these types of landing pages. My thought is that a prospect that has either clicked a link to inquire about a domain name or someone who landed on a domain name to see if it was being used does not need to be convinced that buying the domain name is a good idea. Similarly, someone who only knows that domain names cost $10 at GoDaddy will not likely spend 4, 5, or 6 figures on a domain name, even with compelling copy. Truth be told, the majority of offers I receive on names like Travels.com, Stallion.com, and Lilac.com is under $100, likely due to people not knowing that domain names like these are worth significant sums of money. I have always felt that sharing information about domain values is likely a waste of space on the landing page. Mike’s company has sold millions of dollars worth of domain names, and Mike has a ton of experience fielding offers and closing domain name sales. It is very possible that he has sold more domain names than anyone else. As such, I would defer to his expertise on landing page design, so this is definitely something to think about when creating a landing page. For the sake of comparison, I have shared the top section of one of Mike’s landing pages (Obey.com) and one of my landing pages (Travels.com). Click through to see them more clearly. I invite you to share your thoughts. Travels.com goes to a Uniregistry lander. I linked to the landing page, not the parked page. When you click the inquiry link at the top, you are taken to my landing page. I also have created a new design for my domains and I am still testing and changing things around but overall, I am seeing more offers. -The old saying in direct marketing is still true, “The more you tell, the more you sell.” Long copy works and Mike’s new design might be proving the point. -The Inc 500 logo appears to increase credibility. -The link to testimonials also adds to a solid sales message. I suppose it makes sense if it makes some money parking but if not then it could be confusing for the buyer. I have always like directly to the point type landers. I agree and it does. I have always wondered why parked pages are not more attractive. instead of having word links it would make sense from a marketing perspective to have an actual logo link instead of just random text. Having the logo links for Hotels.com, Trivago, Kayak, Priceline etc……I would think would convert far better than just having words. 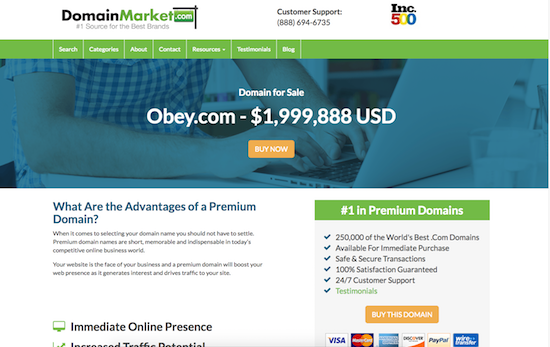 Obviously with parked pages the words are randomly created and fairly targeted for the masses of domain owners names but it would be great if it could be more personalized for great domains that definitely create traffic. I tried whypark and it wasn’t like that. If done correctly, targeted logo ads will convert better than random text. I really like Mike’s lander. The narrative is actually helpful. I like that the narrative is contained at the bottom so you get the relevant details positioned up top, and can scroll down for more if interested. The graphic & layout are nice overall. I didn’t think it would be so definite to me, but you need to obey Mike Mann’s .com marketing strategy, Elliot. Your lander works against you despite the intrinsic value of the domain. That’s not good, not for you and not for all. You can and should give this domain the kind of lander it deserves, which is more like Mann’s. Travels is a truly great domain, singular notwithstanding, and the lander packaging still makes a difference despite the intrinsic value, because it diminishes and detracts. You would be better off with just the parking page itself and an email of form-only link. I’m actually surprised the Travels lander would be like that. Less is definitely less this time, though I also like “less is more” whenever possible. I don’t mind the boringness. I want people to fill out the form and hope to work out a deal. A major reason I posted this is because I think Mike is one of the smartest guys in the space, and what he says holds significant weight for me. I think it would be better to post a screenshot of Obey.com now and Obey.com then so people can really see side by side what Mann is talking about. What I appreciate the most with Mann’s approach is listing pricing. and increase average sales prices for everyone. It is much easier to point consumers to Listing comparisons vs Past Sales as we all know 20-30% go unreported and in other markets difficult to validate sales. Make offer just isn’t a globally accepted concept in “Market places” outside of this industry. It is globally accepted to haggle or negotiate at any time which in effect produces the make offer scenario with less resistance. Different descriptive terms are also emerging which I believe adds to consumer confusion. I think the terms Asset, Property add better organic value in the minds of consumers vs the others. Less explaining to do. I really like the betterhamburger.com page. The simplicity, contrast, bullet points, intro. and the last sentence in the intro isn’t necessary. Thanks for the input. I’m not going to debate but I’ve been involved in SEM/SEO since 2003 and trust me I know my stuff. Thousands of different domains, all of them with the very same text…that’s not going to work. Note the “within or ACROSS domains” ? Well, your opinion and I respect this. Now back on topic … I’d go for Elliot’s landing page anyday … better no content (or very little) than duplicate content… just my 2c … hope this helps people reading this and planning to setup their own landing pages. Mann’s approach is very interesting. Almost like telling a story, but I wonder if some of the “Buy Premium Domains Now” verbiage becomes almost a bit too insulting to the customer? Customers nowadays know the value of a great domain name. They don’t need that shoved down their throats constantly across the entire landing page. What might be more useful is a easy to navigate website with a clear contact form. If you’re interested, check out our website at domahub.com!